Warton Typhoons proved too strong for FC Rangers and went join-top of the Blackpool and District Youth League’s Under-14 division. Poulton Town remain top of the division with another three points. Poulton’s scorers in the 7-2 win over Foxhall Hoops were Alfie Douglas and Jack Ong with a brace apiece, Thomas Powl, Kobe Moore and Regan Malone. Wyre Juniors moved up to third with a win over St Anne’s Diamonds, Wyre’s goals coming from Connor Ashton, Oliver Broughton, Harvey Brown, Dylan Copeland, Adam Stafford and Jake Ward. The Under-15s didn’t have any league games as many were involved in the Lancashire FA Cup. Squires Gate Reds travelled to Brierfield Celtic and were unlucky to just lose. AFC Blackpool took on local rivals Foxhall Juniors, who were very strong on the day and got the win. Kirkham Juniors Reds had high hopes for the cup this season, having reached last season’s quarter-fnals, but they were undone at the hands of Great Harwood Rovers. The Reds took the initiative and scored first with a good strike from Luke Weaver but they couldn’t hold on and Rovers scored just before the break. In the second half, Kirkham again took the lead through Dom Turner but again Rovers replied soon. In the closing stages, Kirkham started to tire and Rovers took advantage with a couple of quick goals to seal the win. In the U18s, Poulton Town and Foxhall JFC had a competitive match at the Civic Centre but Foxhall took the points to go second, above Clifton Rangers who didn’t have a match. 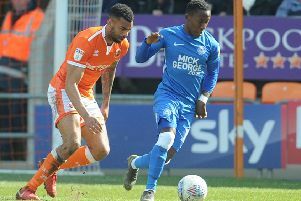 Blackpool Rangers continued their 100 per cent start with a win over FC Rangers to stay top. Thornton Cleveleys JFC were away at Mill Hill in the U18’s Lancashire Cup. This was a nailbiting match, with both sides playing some great football. It ended all square and the Thornton players kept their nerve in the penalty shootout to progress to the third round. Foxhall JFC also progress with a walkover. The Under-8s played development matches and it was great to see so many enjoying the game. Blackpool, captained by Chloe Chambers, scored three quality second-half goals to seal their second league win of the season. Elise Squire Cannell blasted past the helpless keeper from 15 yards a minute after the restart. Four minutes later Molly Grove added a second from six yards, while Weronika Gorecka swivelled and hit a stunning half-volley from just under the bar from 25 yards. YMCA never recovered from a bad start at Seafield Road, the visitors taking a 3-0 lead inside the first 10 minutes. YMCA came more into the game but Burnley added two further goals to reach half- time 5-0 ahead. YMCA were unlucky not to take three points from this end to end contest in the Ribble Valley. The home side started the stronger but YMCA keeper Olivia Neal was outstanding. However, a cross was not dealt with and resulted in an own goal. YMCA responded well and after some good approach play from Fran Lyons and Ellie McNally, Isabelle Kells pounced to equalise. Just before the interval an excellent run from Georgia Norman enabled Honey Griffith to make it 2-1 at half-time with a sweet shot. After the break YMCA again had more of the possession but found the home goalkeeper in great form. Langho equalised from a free-kick on the edge of the box. Abbey Smith almost put YMCA ahead again with a late header which narrowly missed the target. Saisha Bracken, Madison Lucas and Ellie Jones were all outstanding in the YMCA defence. YMCA edged through to the third round of the County Cup in a hard-fought tie at Seafield Road. Defences dominated in the first half, and few chances were created. However, the visitors snatched the lead five minutes before the break when a low corner was deflected into the YMCA net. It remained close after the restart but YMCA gradually took the initiative and equalised 10 minutes from time, when Noah Nicholson lobbed a hopeful ball into the visitors’ box which eluded everybody and dropped into the net.Five minutes later YMCA were awarded a penalty for handball and the impressive Nicholson stepped up to seal a narrow victory in a game which could have gone either way. Olly Mason and Olly Chadwick were notable throughout for YMCA. YMCA produced an excellent first-half performance at Seafield Road and raced into a 5-0 lead with two goals apiece by Felix Twitchet and Connor Normal plus a strike from Mason Wilkins. YMCA appeared to rest on their laurels after the restart, which allowed Rangers to get back into the game with three goals. However, Twitchet burst through on the right and fired an unstoppable shot into the far corner to complete his hat-trick and seal the win. YMCA had to travel to east Lancashire with a depleted squad for this County Cup second-round tie. They started well but fell behind when a defensive error gifted the home side with a goal. YMCA responded well, with some excellent football, and strikes by Mason Wilkins and James McNamara gave them a 2-1 lead at half-time. Having no substitutes available and having played a league game just 24 hours earlier. YMCA understandably began to tire and the home side added a further three goals.